A great exhibition dedicated to Art Nouveau, the artistic and philosophical movement that during the final decades of the nineteenth century and the early twentieth century influenced figurative arts, architecture, and applied arts. Known as “Stile Liberty” in Italy, “Jugendstil” in Germany, “Secessionsstil” in Austria, “Modernismo” in Spain, and “Modern Style” in Great Britain, this movement was a cultural phenomenon that spread across all Europe. Over 200 works on display in the Stables and historical spaces of Miramare Castle on loan from the prestigious collection of the Museum of Decorative Arts in Prague to recreate the Art Nouveau cultural universe, when new artistic expressions confronted the eclectic style of the nineteenth century, to mark the modernisation and rebellion against the stagnant and sterile figurative arts of the time. 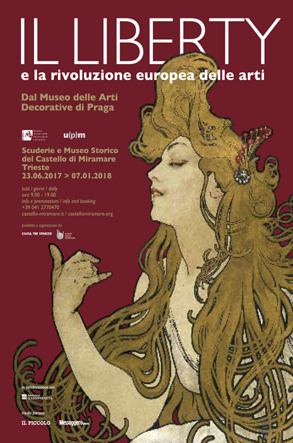 Promoted by The Museums of Friuli Venezia Giulia, the Historical Museum and Park of Miramare Castle, and the Museum of Decorative Arts in Prague, and produced and organised by Civita Tre Venezie and Villaggio Globale International, this exhibition describes the advent of “Modern Style” and the crucial years of the revolution and emancipation of the arts impelled by the rise of modernity and the new aesthetic and spiritual needs. An explosion of curved, sinuous, and dynamic lines, bejewelled with elegant decorative elements, elaborate leaves, curving flowers, long slim stems, and dragonflies and peacocks, permeating traditional arts such as painting and architecture as well as all forms of applied arts, from glassware to ceramics, from graphics to furniture, from jewellery to fashion and design. Along with artists of the highest calibre, such as Jan Preisle and Alfonse Mucha – one of the most important and representative protagonists of Art Nouveau in Europe –, the exhibition will also present examples of the innovative graphic works by the Viennese Gustav Klimt and Koloman Moser. Also on display: jewellery by Emanuel Novák, Josef Ladislav Nemec, and Franta Anýž; examples of celebrated Bohemian glasswork; creations by cold glass decoration pioneers Adolf Beckert and Karl Massanetz; furniture designed by Otto Wagner’s Wiener Akademie students –the great Jan Kotěra, Josef Hoffmann, and Leopold Bauer – as well as works by the leading representative of the Prague association Artěl, architect Pavel Janák. From painting to lithography, from posters to jewellery, from amazing glass to ceramics, from furniture to fabrics, from clothing and bed linen to tableware: the Trieste exhibition – curated by Radim Vondracek, Iva Knobloch, and Lucie Vlckova, and directed by Helena Koenigsmarkova (Director of the Museum of Decorative Arts in Prague) and by art historian Rossella Fabiani – revives the Belle Époque world and the bourgeoisie coming to terms with progress, to illustrate this era and its quest for beauty and balance and its all-important integration of art into life.